Three Poems by Suvojit Banerjee: "Letters and Postcards from the other side of the glass wall", "While we died, a new plant was born", "A tale of past and present and future"
Suvojit Banerjee has seen twenty eight summers, but he doesn’t remember all of them; his existence is torn between the suburbs in West Bengal he grew up in, and the city called Atlanta he now lives in. The world around him adorns many masks, and so does he, while roaming around its streets with the eyes as a journal and his soul as a pen. He is searching for answers in this surreal yet slimy maze, but the questions keep on changing every time. Three Poems by GF Boyer: "Fledgling", "Mercy", and "Ascending/Descending"
GF Boyer is a freelance editor, creative writing instructor, and the editor of Clementine Poetry Journal https://clementinepoetry.wordpress.com/ and Clementine (Unbound) (https://clementineunbound.wordpress.com/). Her poems have appeared in a number of publications, including The Southern Review, Prairie Schooner, Poetry Northwest, RHINO, and Heron Tree. Three Poems by Pijush Kanti Deb: "Life is Colorless", "For a Refreshing Annual Honeymoon", " Happiness Is To Be Digested"
Pijush Kanti Deb is a new Indian poet with more than 234 published or accepted poems and haiku in more than 75 national and international magazines and journals,[print and online] including Down in the dirt, Tajmahal Review, Pennine Ink, Hollow Publishing, Creativica Magazine, Muse India, Teeth Dream Magazine, Hermes Poetry Journal, Madusa’s Kitchen,Grey Borders, Dead Snakes, Dagda Publishing, Blognostic and many more. He is the editor of Poebita Magazine. Three Poems by Kika Dorsey: "Everything Comes in Threes", "Thirst", and "Journey to Lakes"
Originally from South Bend, Indiana, Kika Dorsey is a poet and professor living in Boulder, Colorado, and lives with her two children, husband, kitten, and Border Collie. She wakes up at 5:00 every morning and crafts poetry out of dreams, myths, her body, and her travels. Her poems have been published in The Denver Quarterly, The Pennsylvania Literary Journal, The Comstock Review, Freshwater, The Columbia Review, among numerous other journals and books. . Her collection of poems, Beside Herself , was published by Flutter Press. Her full-length collection, Rust, is coming out with Word Tech Editions August 2016.. She is a professor of English at Front Range Community College. When not writing or teaching, she taxis her teenagers to activities, swims miles in pools, and runs and hikes in the open space of Colorado’s mountains and plains. Four Poems by Matt Duggan: "No One Loves Us Like The Graveyards", " The Crow", "Acrobat", "The Heart That Had Two Eyes"
Three Poems by John Grey: "A Sundown Sleep", "My Rescue", "Something Else"
John Grey is an Australian poet, US resident. Recently published in New Plains Review, South Carolina Review, Gargoyle and Silkworm work upcoming in Big Muddy Review, Main Street Rag and Spoon River Poetry Review. Three Poems By Julia Hones: "Life Changes", "Fear is the heart running away", and "Garden Soul"
My poetry and stories have appeared in a vast array of literary journals and anthologies including Foliate Oak Literary Magazine, Embodied Effigies, Loud Zoo, The Medical Literary Messenger, The Voices Project, Coffee Shop Poems, Mother Bird, Digital Papercut, Vox Poetica, The Artistic Muse, and many others. To learn more about my list of published or forthcoming material you can check my literary blog. Three Poems By KG Newman: "Postmortem Imagination", "Empty Beds", and "Harvest Cycle"
KG Newman is the editor of a high school sports website, ColoradoSportsNetwork.com, and lives in Aurora, Colo. He is an Arizona State University graduate and his first collection of poems, While Dreaming of Diamonds in Wintertime, is available on Amazon. Four Poems by Todd Outcalt: "Class Photos", "Antiques", "A Tree the Memory of a Tree", and "Passenger Pigeons"
Todd Outcalt is the author of thirty books in six languages, including Common Ground, Candles in the Dark, The Best Things in Life Are Free and Where in the World We Meet (his first poetry collection). His most recent poetry has been published in The Oklahoma Review, Rattle, Poetry Quarterly, and elsewhere. He lives in Brownsburg, Indiana and enjoys kayaking, hiking and travel. Three Poems by Dale Patterson: "on jade melmac", "old harry’s greed", and "rockhound"
Three Poems by Soodabeh Saeidnia: "Mailboxes", "Neverland" and "Scientific Concept of Love"
Soodabeh Saeidnia was born (1973) in Iran and received Pharm.D. (1997) and also Ph.D. of Pharmacognosy from Tehran University of Medical Sciences (TUMS) in 2002. She was Visiting Researcher (2002-2003) at Kyoto University, and was also awarded a Foreign Researcher Fellowship to work as a Research Associate both at Kyoto University (2005-2006), as well as Associate Professor at TUMS (2007-2015) and Visiting Professor at Saskatchewan University, Canada (2013-2014). She has written roughly 150 scientific papers for various academic journals, as well as books in both English and Farsi. Three Poems by Jay Sizemore: "What is known", "The illusion of starting over", and "Subconscious gods"
Jay Sizemore is not your enemy. He's just a writer, someone who writes things and then spends weeks regretting it. Sometimes he questions the motives of the muse, but he's handcuffed to her for life. You can find him at jaysizemore.com, or, if you're a stalker, in Nashville, TN, where he may or may not actually exist. Three Poems by David Subacchi: "Skateboarding in the Square", "Too Late", and "They"
David Subacchi lives in Wales (UK) where he was born of Italian roots. He studied at the University of Liverpool and Cestrian Press has published his poetry collections First Cut (2012), Hiding in Shadows (2014) and Not Really a Stranger (due in May 2016). Ken Murphy is a retired war veteran residing in South Carolina with his wife Deena of 16 years. He became interested in photography in 2011, and especially likes photographing nature. In his spare time Ken enjoys working out, working with weapons, and spending time with family and friends. CNF/Essay by Glenna Blomquist: "Paradise Mobile Park"
CNF/Essay by Lynda McKinney Lambert: "A Visitation from Butterflies"
Lynda McKinney Lambert is a retired fine arts and humanities professor from Geneva College, Beaver Falls, PA. She resides in a small village in western Pennsylvania with her husband, Bob, 4 cats and 2 dogs. Lynda is the author of Concerti: Psalms for the Pilgrimage, published by Kota Press. She writes articles on the humanities, contemporary poetry and inspirational human interest stories. Her teaching career took her to Europe each summer where she taught drawing and writing to college students. She also taught a course in Puerto Rico every spring semester for the college. Lynda loves to write, knit. and travel. Jeff Burt works in mental health and has work in Amarillo Bay, The Nervous Breakdown, Atticus Review, and forthcoming in Per Contra. 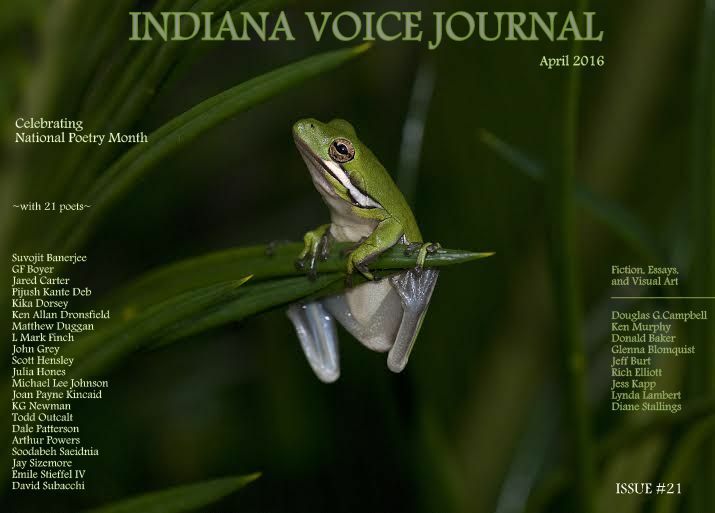 He has published poetry in Indiana Voice Journal previously.